Strike Industries is quickly becoming a go-to accessory manufacturer. The Strike Industries Extended Magazine Plate is a great accessory option for those who have selected the Glock 42 or Glock 43, but would like just a little more firepower. The S.I. Extended Magazine Plates are custom designed to fit onto the single stack Glock magazines, and provide an additional 2 rounds of capacity. Strike Industries has rocketed into firearms world in just 4 short years of existence. Having a former military CEO, who along with the rest of the staff, is an avid AR-15 and pistol shooter, the Strike Industries team has put their heads together to offer a wide variety of well thought-out and very practical firearm accessories to enhance the firearm and the shooter. The S.I. (E.M.P.) 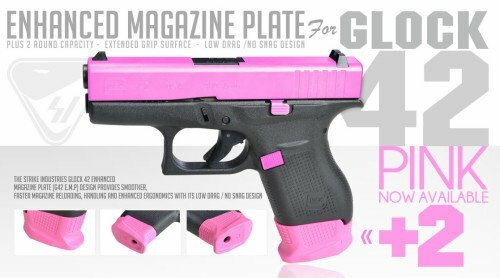 for the Glock 42 comes in black or pink (photo Strike Industries). When the Glock 42 finally hit the market, there was a collective groan from the firearms community. Not that we weren’t excited to see Glock finally answer the call for a single stack, compact Glock tailored to concealed carry, but many were hoping that Glock would come out with a 9mm version first. Glock was slow to enter this part of the market, and several competitors (like Ruger, Sig Sauer, Diamondback, Kahr, Kel-Tec, and Smith & Wesson) had a significant lead. Remember, when Glock produced the Model 42, in .380 caliber, the hot trend for compact .380’s was starting to wane with a strong push for the same characteristics in a 9mm. Despite all the negative press for Glock’s choice to produce a single stack .380, early reports indicated Glock sold hundreds of thousands of the Glock 42. Maybe not a popular move in the American market, but a wise one for the world market that is much stronger on .380. 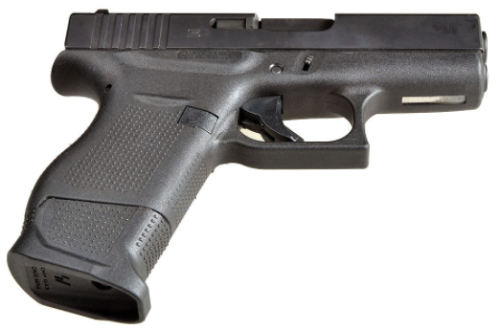 Glock followed up in short course with the much-anticipated Glock 43, in 9mm, and has very quickly achieved market success to challenge all of its competitors. If there was one complaint on either the Glock 42 or 43 it was the minimal capacity. Strike Industries saw this shortage as an opportunity and the Enhanced Magazine Plate (E.M.P.) was born. The S.I. (E.M.P.) in pink (photo by Strike Industries). The Strike Industries Glock 42 Enhanced Magazine Plate (G42 E.M.P) design provides smoother, faster magazine reloading, handling and enhanced ergonomics with its low drag / no snag design. It provides multiple functions to include additional 2 rounds, and extended grip surface for better weapon handling. This makes the Glock 42 an 8+1 pistol instead of a 6+1 standard version. When considering that a concealed carry pistol is intended for self-defense in close quarters, having an additional (2) rounds is extremely important. The E.M.P. The Glock 43 S.I. (E.M.P.) in black (photo by Strike Industries). Strike Industries Glock 43 E.M.P. The Glock 43 has had even more success than its predecessor the Glock 42. Chambered in the highly popular 9mm cartridge, and maintaining so many of the standard Glock features that it truly feels and performs like a miniature Glock. Yet, like the Glock 42, the Model 43 only had a 6+1 capacity, limiting its effectiveness as a CCW firearm. Making the ideal concealed firearm is very difficult. On the one side end-users are demanding a pistol small enough for pocket carry, or very concealed IWB or belt carry. On the other side end-users still need enough rounds to be able to successfully engage and defend themselves from a violent attack. The Glock 43 E.M.P. is easily installed (photo by Strike Industries). 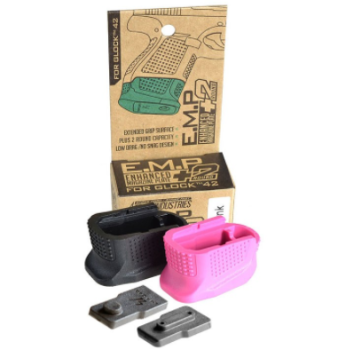 Once again Strike Industries answered the call, and produced their Enhanced Magazine Plate (E.M.P.) 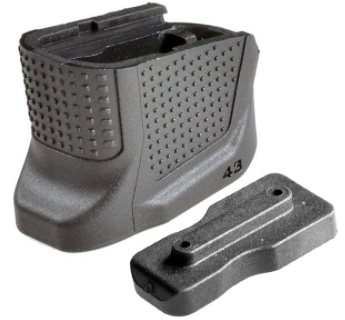 to uniformly fit the standard Glock 43 magazines. The design mimics the contour of the Glock 43 and the body of the E.M.P. 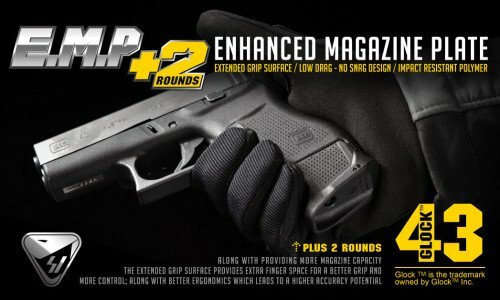 also keeps a similar texture for consistent feel, providing the same benefits as the Glock 42 E.M.P. With the extension, most shooters should be able to get all their fingers onto the grip, which is the best method for accuracy and weapon control. Easily installed – same procedure for standard Glock magazine plates. The Enhanced Magazine Plate makes the Glock 43 an 8+1 pistol instead of a 6+1 pistol, which is much more respectable for a gunfight that will likely be up close and personal, and very fast. If you are going to extend the grip length that much why not just carry a Glock 19? There are definite reasons to do just that, as I’m in favor of mid-size pistols for CCW. They aren’t too big, but offer much more capacity. However, the Glock 43 is still thinner and slightly shorter than the Glock 19. The Strike Industries E.M.P. will make the Glock 43 slightly taller than the 19. Good points, and something a shooter should consider. Thinner? Shorter? or more capacity?